Surprise! 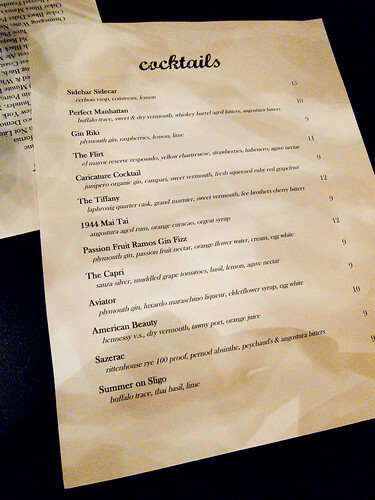 Jackie Greenbaum is at it again, this time opening up the speakeasy, fancy cocktail drinking, vinyl record playing, munchie snacking, Sidebar. In case you didn’t make it through the previous sentence, the bar is called Sidebar and its located adjacent to Jackie’s Restaurant – the two are connected via an inside doorway and also have separate outside entrances. For anyone no familiar, Jackie is the proprietor of previously reviewed Jackie’s Restaurant and Quarry House Tavern. As I first pontificated in our review of Jackie’s, I love downtown Silver Spring for its unpredictability, and Sidebar delivers and delights by providing another great place to hang out with friends and fellow Silver Springers. Val and I teamed up with our friends and fellow Silver Springers Matt and Marisa for our inaugural visit to Sidebar. The outside entrance is located just to the right of the Jackie’s entrance, under a black and white stripped awning and next to a large picture window which showcases the bar. The main bar is fairly small – seating maybe a half dozen folks or so. 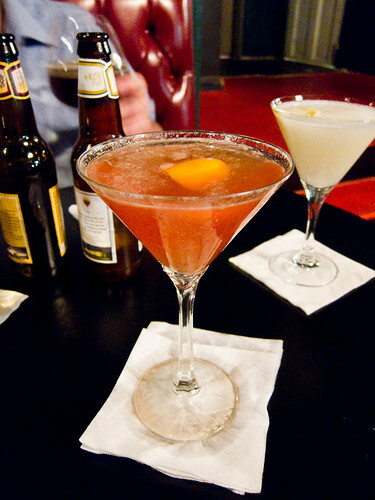 But that’s the point – it’s a cozy neighborhood hangout, where bartenders take their time to make great cocktails. 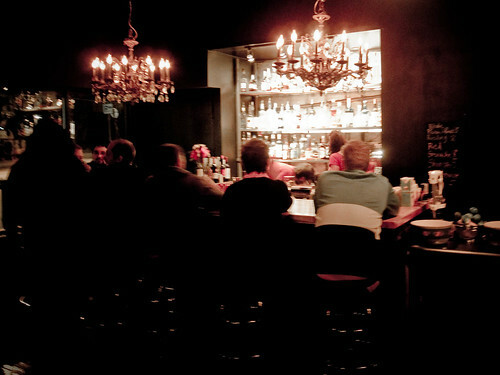 The bar is dimly light by overhead chandeliers and backlight by glistening shelves of liquor on the wall. There were two bartenders the night we went, squezing fresh juices for the drinks and taking their time to make yummie concoctions. While there was lots of standing room by the bar, all the stools were taken, so we headed past the pool table and down a few steps into the lounge seating area. The lounge is still part of the same room, just a bit lower and separated be a railing. We chosen a rounded booth with a small table and a few chairs opposite the booth. There were a few other people in the room and a group of 6 or so behind us. As with the bar, the lounge was dimly lit and cozy. None other then Jackie herself was serving the lounge and she dropped off cocktail, beer, and food menus. After some pondering and asking Jackie about her favorite cocktails, I chose the Caricature – I like gin – and Val chose a Aviator, Matt and Marisa chose beers, and we placed our order. While we waited, I noticed a pile of crates filled with records in the back corner. A few minutes later, I saw some folks rummaging through the records and swapping them on the turntable. That explained the exlectic mix of music. Like a juke box, but free :) We heard everything from classic rock to 90s punk to country.